the Dora Mavor Moore Award for her first play, Thy Neighbour’s Wife. brought her to Vancouver for a conversation with our writer-in-residence, Susan Crean, about writing as a means of social change. This entry was posted in Joy Kogawa & Kogawa House, Literary Events, Main Page, Multicultural events, Upcoming Events on October 30, 2011 by Todd. Story on Wednesday night. It is wonderful! gritty reality of ethnic clashing in multicultural inner city. This is the 1957 classic composed by Leonard Bernstein with lyrics by a young Stephen Sondheim. Vancouver Opera has thankfully decided to use the original dance choreography by Jerome Robbins. It is a well-done production that every musical theatre student should see. And judging by the audience, many young theatre and musical students were there. It is a treat to see a full production treatment of West Side Story, instead of a community or high school theatre production. Everything sparkles and sings in its detail. LUCIA CESARONI as Maria. She is a strong soprano, and her speaking voice is a strong Puerto Rican accent. ROBYN WONG as Consuelo, and many more. Or it could be a Maria who has just arrived from the Phillipines? And her brother Bernardo is in a Phillipine gang that is struggling with finding their own place in the Asian-Canadian landscape against multigenerational Chinese-Canadian gangs. My review to be continued and will posted later today…. This entry was posted in Main Page on October 27, 2011 by Todd. 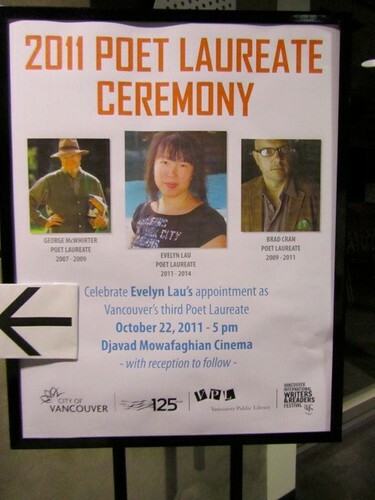 Evelyn Lau became the third Poet Laureate for the City of Vancouver on Saturday October 22nd at Simon Fraser University Woodwards Centre, as part of the Vancouver 125 Poetry Conference organized by then current and outgoing Poet Laureate Brad Cran. Lau's first book of poetry Oedipal Dreams was nominated for the Governor General's Poetry Award, making her the youngest ever poet to be nominated. 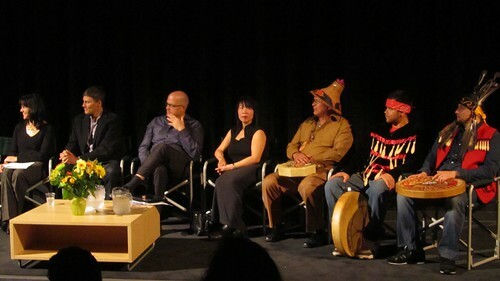 MC Sandra Singh – Chief Library of VPL, Mayor Gregor Robertson, Brad Cran, Evelyn Lau, First Nations singers and dancers. Laureate Brad Cran reads a poem and speaks of his time as the 2nd Poet Laureate. During the reception we posed for a photo, Susan Crean (writer-in-residence at Historic Joy Kogawa House), Vancouver councilor Ellen Woodsworth, Evelyn Lau, Todd Wong. 3 weeks prior, Evelyn had give a reading and discussion at Kogawa House, hosted by Susan Crean. Wong is president of Historic Joy Kogawa House Society. Councillor Woodsworth has been a big supporter of Kogawa House, and helped guide us in our 2005 presentation to City of Vancouver, asking for assistance to halt the proposed demolition permit for Kogawa House. 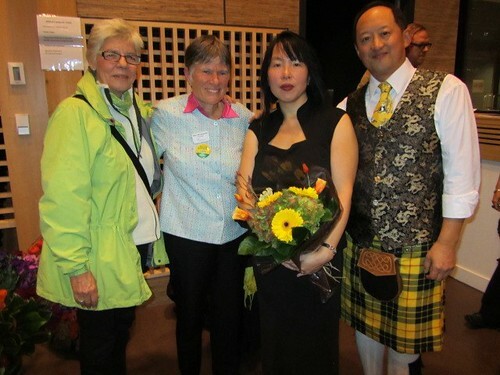 This entry was posted in Asian Canadian Cultural Events, Joy Kogawa & Kogawa House, Literary Events, Main Page, Multicultural events, Todd Wong on October 26, 2011 by Todd. 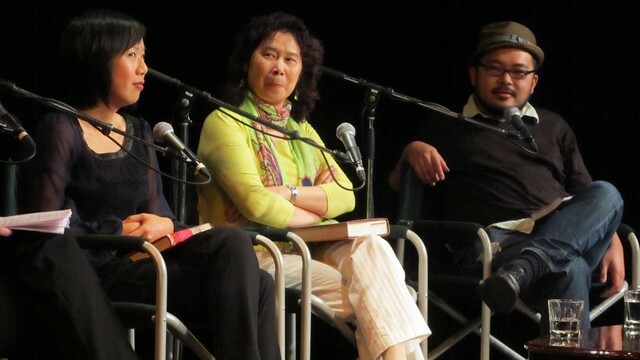 This is my favorite photo of the three writers Jen Sookfong Lee, Ling Zhang and Kevin Chong. They each displayed wonderful humour. Jen is of course the most expressive with subtlely outrageous statements about her mother, food, and her writing habits. Ling Zhang is the most melodramatic, in a classic Chinese self-denying sort of way, while she claims she doesn't want her writing to be so melodramatic. Kevin Chong is straight-ahead deadpan humour with insightful observations. Chong admitted that he never really wanted to originally be a classic style “Asian-Canadian writer”, since he came to Canada in the late '60s from Hong Kong with his parents. And to some extent he has avoided the familiar storylines of head-tax survivors toiling in Chinatown for meagre salaries, and triumphantly integrating into Canadian society (or not) in spite of racism. Chong instead has opted to write a different kind of Asian Canadian character for his new novel “Beauty and Pity” that is about a post-1967 post-modern immigrant-slacker. But it is still an update of the clash of generations and how the character must reconcile an Asian-Canadian identity for himself. I bought “Beauty Plus Pity” at the Word On The Street Festival, because I arrived late (due to a previous engagement) at Chong's book launch held at The Penthouse Nightclub, because I was too busy chatting with others when they packed up the books for sale. Jen Sookfong Lee is a familiar voice on CBC Radio with her “West Coast Words” segment for “On The Coast”. 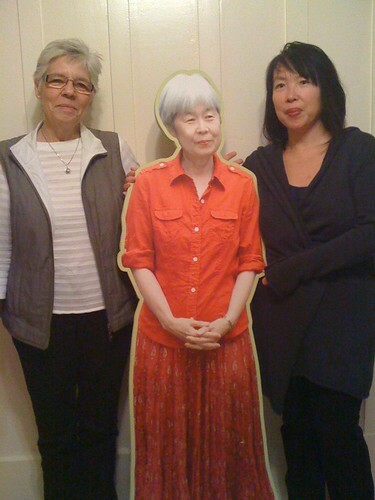 She has revealed previously little known characters from Asian Vancouver for her latest novel “The Better Mother”. Set during the 1980's, Danny is a gay Asian, who recalls meeting characters from Chinatown's burlesque era in the late 1950's. It is a rich juicy setting that juxtaposes taboo subjects for conservative immigrant families, and Lee's attention to details makes for a colourful read. I really like this book – but I keep borrowing it repeatedly from the library, because I have been too busy to sit down and read anything… so I keep renewing it and renewing it…and re-reading the beginning chapters because they are so re-readable! Ling Zhang is an unknown quality. She has written 5 books, but nobody in Canada has really read any of them, because they were all published in China and only available in Chinese…. until now. Zhang's newest novel is Gold Mountain Blues, translated from the Chinese publication because Zhang writes in Chinese. She has written an epic novel spanning 150 years of Chinese Canadian history, 5 generations of a family, detailing the struggles of early Chinese pioneers coming to Canada to work on the the Canadian Pacific Railroad and integrated into the Canadian cultural mosaic. It is interesting that Zhang is in some sense a recent immigrant, arriving in Canada in 1986 – part of the most recent wave of Mandarin speaking Chinese immigrants whose growing numbers now outnumber the Cantonese speakers of earlier immigration periods. It is yet a new kind of Chinese-Canadian identity, that has arrived prosperous and assured, without the burden of decades of negative self-identity imposed by decades of systemic racism in Canada caused by Colonial racist superiority, head tax policies (1885-1923), The Chinese Exclusion Act (1923-1947), and limited immigration policies (1947-1967). Maybe these issues of different conceptualizations of Chinese Canadian identity is reflected in the author's own experiences of being Chinese Canadian. Over 150 years of immigration, under different circumstances has produced different experiences. Lee's ancestors probably left China when it was still the Qing Empire of the Last Emperor Pu-Yi, Chong's family possibly left Mainland China for Hong Kong while it was a Republic under Chiang Kai Shek or soon after, and Zhang came to Canada long after Mao had led the Communist Party to power. Is it therefore possible to consider that there is a common Chinese Canadian literary identity? Is Zhang appropriating the pioneer Chinese Canadian culture and history to tell a universal story, similar to how WP Kinsella told the stories of his First Nations characters from a Reserve in Central Alberta? Are Lee and Chong broadening the pantheon of Chinese-Canadian characters with their stories? Or are they still all writing the universal story of identity struggle and reconciliation – but with new settings and and characters. Unfortunately these questions never really came up. Discussion topics dwelled on the joys and pitfalls of dealing with editors, agents and publishers, as well as finding their characters. Jen emphasized that the burlesque dancers of Chinatown have never been written about before. Zhang said that she found her inspiration for her novel by visiting a grave site for Chinese pioneer workers outside of Calgary. But the audience had great fun in hearing that the one major common element in each of the passages read by the authors was “food”. Maybe the moral of this literary question is simply that EVERYBODY LIKES CHINESE FOOD! This entry was posted in Asian Canadian Cultural Events, Canadian Identity, Canadian Identity & Heritage, Chinese Canadian History, Literary Events, Main Page on October 26, 2011 by Todd. GUESS WHO IS COMING TO HISTORIC JOY KOGAWA HOUSE? so far you have missed newly appointed Poet Laureate of City of Vancouver Evelyn Lau Oct 2nd, and incredible adventure writer Eric Enno Tam Oct 16th. Don't miss the following writers! Aboriginal performing arts company in Canada. member of the Kogawa House Board , will host the event with me. present, as will Joy Kogawa. 1990s and was the Aboriginal Advisor at Emily Carr College. This entry was posted in Joy Kogawa & Kogawa House, Literary Events, Main Page, Multicultural events, Upcoming Events on October 24, 2011 by Todd. 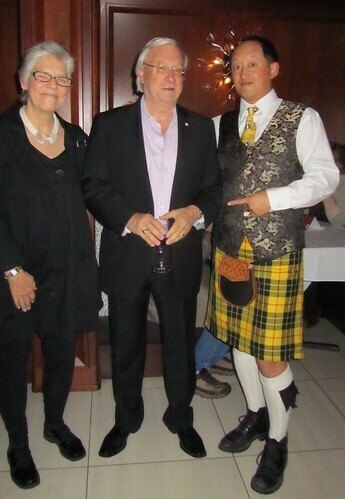 The 40th Anniversary of Douglas & McIntyre Publishing took place at Dockside Restaurant on Granville Island on Friday night, Oct 21st. There were special cocktails named after books published by D&M. I really wanted to try “The Jade Peony” – as I was part of the “One Book One Vancouver” committee that created the programming for the Vancouver Public Library to make Wayson Choy's first novel the inaugural choice for this award winning program. Here are more pictures on my flickr site. This entry was posted in Main Page on October 22, 2011 by Todd. I try to attend lots of literary events through the year. My roles as president of Historic Joy Kogawa House and vice-president of Asian Canadian Writers' Workshop introduce me to a lot of events and writers. 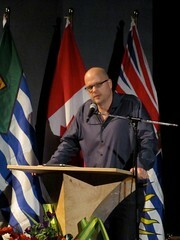 This entry was posted in Asian Canadian Cultural Events, Literary Events, Main Page, Multicultural events, Todd Wong on October 21, 2011 by Todd. Katherine Leonard, Head of INTO Secretariat, London, England. Engaging the Public in Special Places – Summary of Dame Fiona Reynolds’ Talk on Thurs, October 13, 2011. 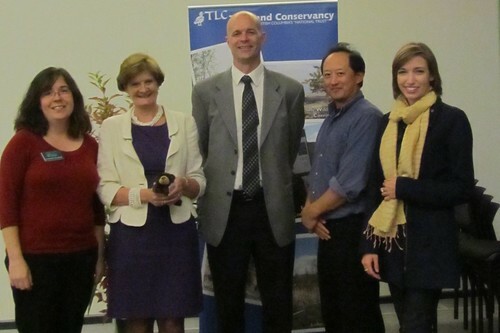 TLC Vancouver area manager Tamsin Baker, Dame Fiona Reynolds, TLC Development Officer John Keller and TLC Board members Todd Wong and Nicole Mackay. Dame Fiona Reynolds speaking – she gave a history about the National Trust, (Wales England and Northern Ireland). It was especially captivating when she gave examples how then National Trust engages with the public. The architecture of the New Visitor Centre of the Van Dusen Gardens is looking stunning! Construction is still going on to finish the ceiling. Here is the talk that Fiona gave in Victoria at the INTO conference. This entry was posted in Main Page on October 20, 2011 by Todd. 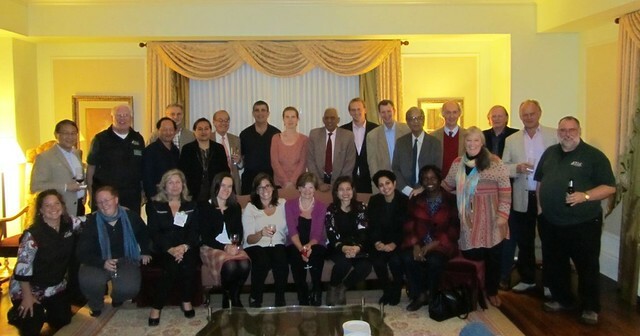 It was a very warm and welcoming reception on Tuesday evening Oct 8th. Leaders from National Trust and conservancy organizations around the world came to Victoria BC, to attend the INTO conference organized by The Land Conservancy of BC. I talked with people from Uganda, Seoul, Malaysia, England, India as well as representatives from Canadian Heritage. cultural heritage are signing the Victoria Declaration on Climate Change as part of the 14th International Conference of National Trusts, October 12-15, 2011.
places in their communities and the stories of their past. rising sea levels have contaminated the fresh water supply with salt. civilization will be lost forever. A culture moved, is a culture lost. enjoy today. It is culture that binds us together around the world. Follow the conference in real time on twitter @2011can, hashtag #INTO2011. Photos will also appear at conservancy.bc.ca/flickr and video footage at conservancy.bc.ca/youtube. Click here for the full Conference Program. This entry was posted in environments and land conservancy, Main Page, Multicultural events on October 18, 2011 by Todd. engagement through this exclusive visual presentation. Mainland office at 604-733-2313. Admission is by donation. This entry was posted in environments and land conservancy, Main Page on October 17, 2011 by Todd.